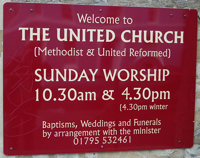 Located in Preston Street in Faversham town centre, the United Church offers a warm welcome to all. Messy Church is held on the 2nd Sunday of the month 3pm to 4.30pm, this is for families and children and is a fun event where everybody has the opportunity to do craft activities, play games and eat food. Parent and Toddler Group. Starting on Thursday 25th September 2014. We meet weekly every Thursday from 13.30 to 15.00. There is a charge of 50p per child with a maximum charge of £1.00 per family. The price includes tea, coffee, squash and biscuits. Sunday worship is at 10.30am, with a tea service at 4.30pm on the 3rd service every month, and Messy Church on the 2nd Sunday of the month from 3pm. The name United Church is a reminder that it serves members of both the Methodist and the United Reformed churches. John Wesley, the founder of Methodism, visited Faversham three times. Initially the response to his preaching was indifferent, but by the time of his third visit it was much more promising. The first Wesleyan church, in Georgian style, opened in 1808. It was displaced by the present Gothic-style building in 1861. To cater for changing needs the interior was altered in the 1980s. The ground floor now serves as a hall for use by the church and for hire for meetings, while an extra floor has been inserted at gallery level to provide a new place of worship. In Faversham the United Reformed church had its origins in a chapel, which became the head of a circuit, built for the Countess of Huntingdon's Connexion in Partridge Lane in 1789. The building still exists and is now used by local brewer Shepherd Neame. 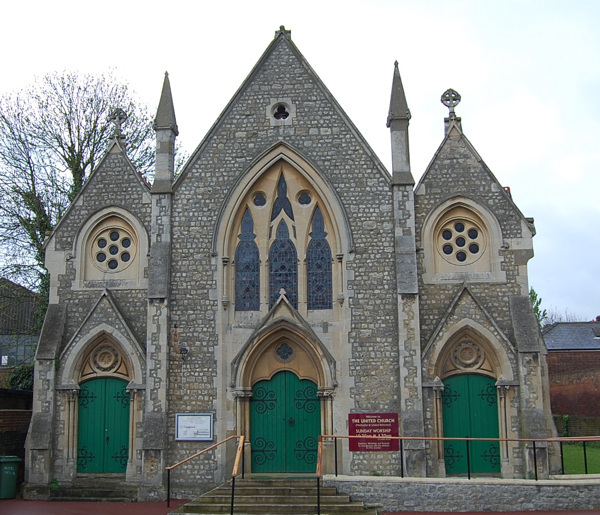 By the time a new church had been built in Newton Road in 1879 to supersede it, it was run according to Congregational (now known as United Reformed) principles. When this church was demolished in 1974 its congregation began sharing the Methodist Church in Preston Street.